I normally take great pride in being an American, but there are passages in our history which all Americans should be ashamed of. During our Civil War in many prison camps, both North and South, POWs were treated wretchedly with inadequate shelter, clothing and food. The worst by far was Andersonville. The vast tragedy at Andersonville came about for a number of reasons. First and foremost was the breakdown of the prisoner exchange system. From the summer of 1862 to the summer of 1863, captured Union and Confederate troops would be released within 10 days after giving their parole. This was a promise not to fight until after they had properly been exchanged for a prisoner on the other side. The system operated by exchanging paroles from prisoners of equivalent ranks or of different ranks as follows: 1 general = 46 privates, 1 major general = 40 privates, 1 brigadier general = 20 privates, 1 colonel = 15 privates, 1 lieutenant colonel = 10 privates, 1 major = 8 privates, 1 captain = 6 privates, 1 lieutenant = 4 privates, 1 noncommissioned officer = 2 privates. The system worked reasonably well until the issue of the treatment of black troops came up. The Confederates refused to recognize black soldiers as Union troops under the system and reduced many of them to slavery. The Union as a result refused to abide by the system. General Grant also had suspicions that the system wasn’t being completely honored in any case. After Vicksburg he had paroled the entire Confederate army that had been captured after the fall of that city. In the fighting around Chattanooga later that year he was dismayed to find among the captured Confederate troops men who had surrendered at Vicksburg and who had not been exchanged. Realizing that the Confederates needed their prisoners back in their ranks , and that the Union had an endless supply of manpower, he thought that it was a benefit for the Union that the system had broken down and adamantly refused Confederate attempts in 1864 to revive prisoner exchanges. A good article on the exchange of prisoners is here. Second was the series of small POW camps in the vicinity of Richmond, which, with the break down in the prisoner exchange system, were soon overflowing with Union prisoners. In November 1863 Captain Richard Widner came to the hamlet (population 20) of Andersonville, Georgia to investigate the prospects of building a large POW camp there. He liked what he saw: plenty of water near at hand, located near a railhead and situated in the Deep South, far away from the Union armies. In December of 1863 he began construction of Andersonville Prison. (The official name of the prison was Camp Sumter.) Local slaves were brought in to clear the land in January 1864 and to build the stockade. The Prison encompassed 16.5 acres with a small creek flowing through the site to provide water. No barracks were built to shelter the prisoners. The capacity of prisoners that could be held there was estimated to be 10,000. The first Union prisoners were shipped to in February 1864. With heavy fighting that began in May as Grant battled his way towards Richmond, the number of prisoners swelled to well beyond the capacity of the prison. By June the prison population had ballooned to 20,000. The boundary of the prison was extended using prison labor labor 610 feet to the north during June. By August 33,000 Union prisoners were held within the stockade of Andersonville. Third, for security reasons, the prisoners were not given the materials to build barracks. Andersonville’s prison guards consisted of overaged men and underaged boys, and permanent barracks where the prisoners could live, and plot escape attempts unobserved, were thought by the authorities to be too much of risk with prison guards of this calibre. The Union prisoners, except for what makeshift shelters they could improvise, were exposed to the elements at all times. Fourth, the creek flowing through Andersonville served both as a source of water and as a latrine. The Union troops, with appropriate black humor, labeled the creek “Sweet Water Branch’. Fifth, medical care at Andersonville was basically non-existent, with the small medical staff completely overwhelmed. Sixth, the Union soldiers were in theory to get the same daily ration as a Confederate soldier. What they received, if they were lucky, was rancid grain and a spoonful or two of peas or beans. To be fair, the Confederates during this stage of the war had a great deal of difficulty providing rations to their own troops. Seventh, incompetence on the part of the camp’s commander Captain Heinrich “Henry” Wirz. Ironically trained as a medical doctor in Europe prior to the Civil War, the Swiss born Wirz took command of Andersonville in March 1864. Tried and executed after the war, the only Confederate to be executed following the war, Wirz has been called both an innocent scapegoat and a demon of cruelty incarnate. I will not venture into that battleground. I will note that in the face of the humanitarian disaster that developed at Andersonville Wirz did little and seemed to spend most of his time trying to get promoted, eventually getting his wish and attaining the rank of Major shortly before the end of the War. One hundred and fifty years ago Union prisoners began arriving at the Andersonville prison camp. A blot on American honor is the callous way in which many prisoners of war were treated during our Civil War, north and south. (For a Union prison camp that had a death rate of 25%, google Elmira prison camp, or as the Confederates imprisoned there referred to it, Helmira.) 45,000 Union soldiers would be held at Andersonville and 13,000 of them would die through starvation, bad water, no sanitation and disease. Accounts of what went on inside Andersonville beggar description. Jesus wept, sums up the reaction of any decent soul to this abomination. See the accompanying post for today for the grim details, and for a shining example of humanity by a man motivated by God’s love to love his enemies. A lecture by John Walsh, emeritus director of the J. Paul Getty Museum, on John Trumbull’s painting on the battle of Bunker Hill and its historical accuracy, or lack thereof. The painting has always been a favorite in my household as it depicts my ancestor Major Andrew McClary of the New Hampshire militia. Trumbull had witnessed the battle through field glasses, he was serving with the American army, although not with the portion fighting on Breed’s hill. 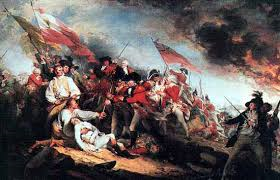 The painting shows the death of General Warren, and is entitled The Death of General Warren at the Battle of Bunker’s Hill, June 17, 1775, the painting having been commissioned by Warren’s family. Trumbull squeezes into the painting almost everyone famous who fought in the battle, both Americans and British. Major Andrew McClary is shown raising his musket to brain a British soldier attempting to bayonet the dying Warren, a warlike action quite in character for him, and one which warms the cockles of my heart. My wife has noted over the years how much I resemble Major Andrew and it is intriguing how his facial features have been passed down through the generations of my family. The thirtieth in my ongoing series examining the poetry of Rudyard Kipling. The other posts in the series may be read here, here , here , here, here , here, here, here, here, here, here, here , here, here, here , here, here, here , here, here, here , here, here , here , here, here, here, here and here. Kipling, as I have often observed in this series, was not conventionally religious. Any man who could refer to himself as a good Christian atheist obviously would never qualify as being conventional in any sense in regard to faith. 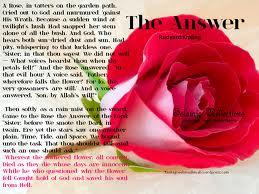 However, many of Kipling’s poems do deal with religion, and few more powerfully than The Answer. At first glance a brief and simple poem, it deals with immensely complicated theological questions involving death, innocence, predestination and trust in God, a poetic rendition of the same issues raised in the Book of Job. Who is this that hideth counsel without knowledge? Therefore I have spoken unwisely, and things that above measure exceeded my knowledge. Hear, and I will speak: I will ask thee, and do thou tell me. With the hearing of the ear, I have heard thee, but now my eye seeth thee. With the end of the Revolutionary War Washington was looking forward to a well earned retirement from public life at his beloved Mount Vernon. On June 8, 1783 he sent a circular letter out to the states discussing his thoughts on the importance of the states remaining united, paying war debts, taking care of the soldiers who were wounded in the war and the establishment of a peace time military and the regulation of the militia. It is an interesting document and may be read here. No doubt Washington viewed this as in some respects his final thoughts addressed to the American people in his role as Commander in Chief. Something for the weekend. George Washington Variations by Ernst Krenek. A refugee from Austria in 1938 after the Anschluss, composer Ernst Krenek became a naturalized American citizen and an ardent American patriot. His George Washington Variations (1950) are a fitting tribute to the greatest American. Although the Union had made substantial progress in the War in 1863, few northerners doubted that the Confederacy was still full of fight. This belief received support in the Union defeat in the battle of Olustee, Florida. Florida was the most lightly populated state of the Confederacy, only 140,000 people. Throughout the War Florida was a side show, with the Union forces content to occupy the major ports of Jacksonville, Key West, Pensacola and Cedar Key, while the Confederates controlled the interior and smuggled needed supplies for the Confederacy through the minor ports that dotted the Florida peninsula. In February 1864 Union Brigadier General Truman Seymour landed a force of about 5,000 troops at Jacksonville to stage raids in north east and north central Florida to collect supplies, recruit black troops and cut off Confederate supply lines from Florida to Georgia. He was under orders not to proceed into the interior of the state. Lieutenant General P.G.T. Beauregard, in command of the Confederate coastal forces in South Carolina, Georgia and Florida decided to counter this move by reinforcing Confederate Brigadier General Joseph Finnegan in Florida to bring his troop strength up to 5,000 men. Ignoring his instructions Seymour led out his 5500 men for a drive across northern Florida with the seizure of the state capital of Tallahassee as a possible objective. Finnegan, massing his forces blocked the Union move by entrenching at Olustee station, 48 miles west of Jacksonville. At 2:30 PM on February 20, Finnegan sent out a brigade to attempt to lure the Federals into an attack on his entrenchments. The Federals did not oblige and Finnegan marched his entire force out from the entrenchments to fight. The battle went on for the remainder of the afternoon with the Union line giving way. Finnegan did not order a pursuit, with the 54th Massachusetts of Fort Wagner fame and the 35th United States Colored Troops repulsing the last attack on the retreating Federals. Union casualties were 1861 to 946 Confederate. The heavy Union losses caused a number of Northern lawmakers to wonder whether it was worthwhile to put any further military effort into a state that had little significance for the War as a whole. Florida remained a relatively quiet sector of the Civil War for the remainder of the conflict with only minor raids and skirmishes. To many Americans it often seems that Congress wastes an inordinate amount of time debating on trivialities. It is at least an old tradition. The Senate spent a month in 1789 debating what the title of the President should be. Washington during the Revolution had often been known informally as His Excellency, but at that time that was the common title for governors of states. 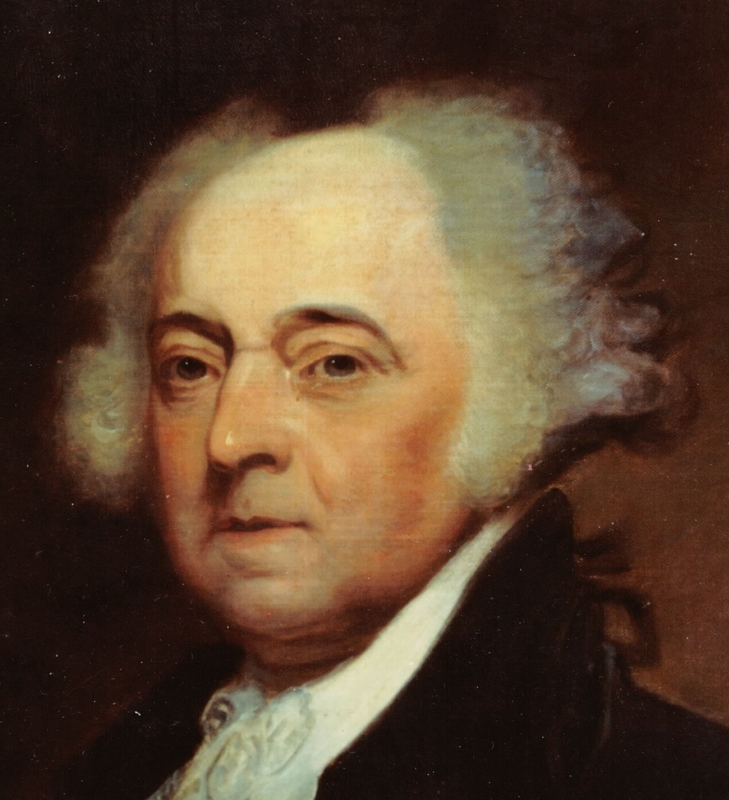 Vice-President John Adams thought that the President needed a royal, or at least a princely, title to sustain the dignity of the office. He suggested such titles as “His Highness” and “His Benign Highness” demonstrating once again how tone deaf to public opinion he tended to be, the American people post Revolution being decidedly anti-monarchical. Eventually a Senate committee approved the title “His Highness, the President of the United States, and the Protector of Their Liberties”. Secretary of State Thomas Jefferson was aghast at the whole business and recalled Benjamin Franklin’s description of Adams as a man who means well for his country, is always an honest man, sometimes a wise one, and who, some times, and in some things, is absolutely out of his senses.